Give Frankie Valli credit. Not only does he know his audience, but — as his string of smash successes during 1960s and 1970s attests — he also knows how to make a hit record. He always has, and despite his nearly 30-year absence from the charts, he hasn’t lost a bit of his perspective on the marketplace. 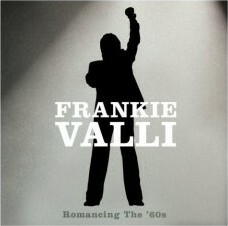 On his latest effort, the aptly titled Romancing the ’60s, Valli — with the help of longtime collaborator Bob Gaudio — puts his own spin on 13 classic cuts that originally surfaced during his heyday. Considering how familiar his source material is — What a Wonderful World, This Guy’s in Love with You, and Let It Be Me are just a few of the songs featured on the set — it’s a rather bold move for him to make. Yet, he nearly pulls off the feat without a hitch. Valli and Gaudio clearly learned their lesson during the 1980s when they dressed The 4 Seasons’ material in the then-reigning production aesthetic of manufactured sounds. On Romancing the ’60s, he — for what is, perhaps, the first time in his career, isn’t aiming to score a younger crowd. Taking full advantage of the momentum he gained from the Broadway show Jersey Boys as well as his recently issued, career-spanning retrospective (Jersey Beat: The Music of Frankie Valli and The 4 Seasons), the duo has assembled a big-budget production that is unabashedly retro. It undeniably is targeted at those who grew up listening to his work, and it follows closely in the footsteps of Rod Stewart’s Still the Same...Great Rock Classics of Our Time and Barry Manilow’s The Greatest Songs of the Sixties. Not surprisingly, Valli’s voice isn’t what it once was, but throughout Romancing the ’60s, he stays well within his limitations. In addition, the arrangements are polished until they glisten and gleam, but that’s not a new approach for Valli and Gaudio to have taken. Valli always has sounded authentic, no matter the setting. Surrounded by airy bossa nova beats and gently supportive string sections, he effortlessly finds the heart and soul of songs like Stevie Wonder’s My Cherie Amour and Phil Spector’s Spanish Harlem. He slows down the Carole King/Gerry Goffin-penned Take Good Care of My Baby and twists it into a weepy heartbreaker worthy of Nat King Cole. He also revels in the bright, summery refrains of Bobby Hebb’s Sunny. Romancing the ’60s progresses in a fashion that is similar to one of Valli’s concerts, and it culminates with a medley of Smokey Robinson’s My Girl and The Rascals’ Groovin’, an inspired rendition of Jimmy Ruffin’s What’s Become of the Broken Hearted, and, appropriately enough, a cover of On Broadway that unites Valli with The Jersey Boys. For certain, Romancing the ’60s can’t compete with the monumental music that Valli made in his youth. Then again, this isn’t really the point of the endeavor. Romancing the ’60s is a love letter to the past, and it is a reminder of more innocent times. Better still, it also it manages to transcend its obvious commercial intent.